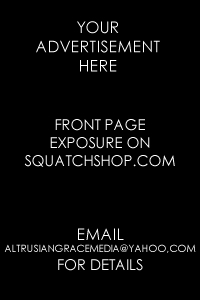 So as the Squatch Shop begins its journey online, I'd like to announce that eventually I want to do an Amazon gift card giveaway. To do this, I am looking to accumulate $1000 (I only receive 4%-6% of this)in sales first. If you want to be notified and would also like to be included in the drawing when it happens please fill out the contact form on the right side and include the term "Mailing List" and your email address in the message box. If you'd like to help me get to my goal faster, I will be creating a "Specials" page that will contain certain 'free trial' deals from Amazon. These cost you absolutely nothing except the few minutes it takes to sign up and you can cancel after only one day. Doing this boosts the bottom line of the Squatch Shop and gets me closer to giving you a gift card. I don't know how much it will be yet, but at minimum $10, hopefully more! The Squatch Shop aims to be your one-stop shop for all Bigfoot and Sasquatch related items. In our store you will find everything from outdoor camping gear and tech equipment for your 'squatching expeditions all the way to fun stuff like tshirts, books, and novelty items. You can shop in confidence because all of our items are served by Amazon and Amazon-backed affiliates. Let us know if you'd like to advertise, trade links, or if there's an item you'd like to see us carry in the store!